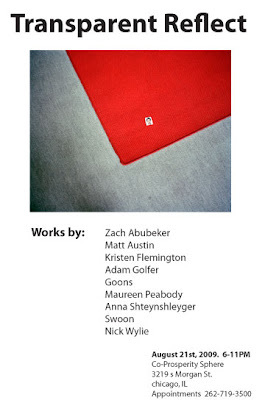 We are exited about this new show at our space, The Co-Prosperity Sphere. Transparent Reflect examines portraits and self-portraits relationship in art. The show takes the traditional approach of making a portrait from an observational standpoint and mixes it with the more reflective side of a self-portrait. The artists in the show use photography, drawing, painting and installation works to portray their ideas though a range of formal and abstract approaches. They use religion, sexuality, popular culture and the present economic times to create a response to the current state of the nation. Transparent Reflect questions the notion of identity, and brings forth reflection that is required and lately ignored in today’s society.